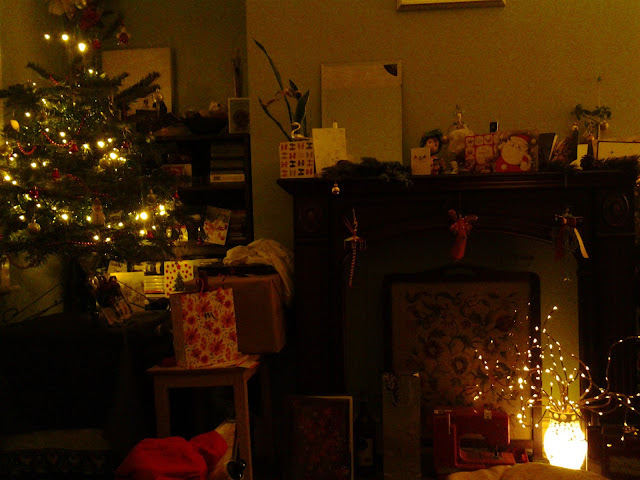 Here is a small glimpse of our Christmas living room. I'm feeling very cosy and festive despite the stinking cold that Tom has shared with me. We have been well gifted and well travelled. The boat home from France was rather rough, but it was lovely to see Tom's dad. We've also been down to Dorset to see Tom's mum and had my family for lunch before the family party. One of my favourite gifts was Rachel Held Evan's A Year of Biblical Womanhood where she tries to live for the year according to bible verses that supposedly apply to women. It's funny and touching and I need to read it again.